If you struggle in finding importers having significant experience of handling goods with quality and as per market standards, you should search them on the best importers directory. BROOKLYN, N.Y. - Nov. 20, 2018 - PRLog -- International shipping is one of the complex duty only a business dealing into international business can understand. Still, among them, it is a no-brainer job to some but to many it is highly complicated to cope up with. Global shipping process comprises a lot of variables. Import and export of goods require the helping hands of so many parties such as local truckers to customers brokers, steamship lines, freight forwards, rail companies and more. Communication is another, and cultural difference adds more complexity to your import process if you don't tie up with an experienced importer company. If you struggle in finding importers having significant experience of handling goods with quality and as per market standards, you should search them on the best importers directory. 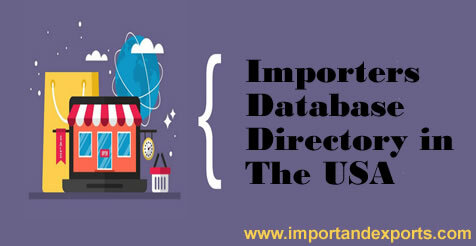 Online B2B Directory is a blessing to every small and large-scale company who need to operate import and export of goods as a significant business operation activity. "importandexpots.com" is one such excellent B2B Trading Marketplace that enables companies of all sizes, as well as startups, opt a right position for themselves in business arena by simplifying the search for importers and exporters in the USA as well as in the globe. They provide all advanced and modern digital tools along with a comprehensive importers directory that today's business requires to grow. This portal offers better contacts to build a network than wandering around yellow pages. Importandexports.com has an amazing database directory and available along with advanced search filters. Through this tool, you can filter the database to find the right importers who have experience of importing the goods your manufacture or produce. For instance, Agro and medical products require some temperature management to some degree. The importer you have contacted must have the license to ship products from one place to another, as well as special loaders and carriers to keep products safe and fresh. You can find importers on importandexports.com at great convenience. The website has 10+ million registered users all across the world. Since the site is advanced, they facilitate features such as reviews section, community forum, and online communication to name a few that is helpful and should be used to find the potential business partner. Additionally, you can update your company details like email, contact number, address that further enable you to share your needs on the community. Once you post your requirement, you get quotes from the different importers who can help you ease your business requirements. Need to update information about your company. Globalize your business and find new opportunities with "importandexports.com."